Nightly RATES are for 2 Guests. Each additional Guest pays $50 per night. You have sole Occupancy of THE CARRIAGE HOUSE Cottage Apartment which is on a Horse Breeding farm 5 mins from restaurants and shops in Kerikeri. You look over the Kerikeri Inlet with jetty for your boat or Kayak or just take a walk to enjoy the reflections of moored yachts. Good location for exploring the Bay of Islands.To the north Beaches and the old Whaling Port of Manganui with a Whaling Museum. To the South Waitangi Treaty house and Paihia where many boat trips start.You can go sailing for the day or visit Russell another unspoilt Whaling Port with good selection of Coffee shops and great views over the bay.Kerikeri was first settled by Missionaries and the Trust Mission House and adjacent Stone Store are open to visit. This is just a 20 minute walk from your accommodation. A little further you can walk beside the river to the Rainbow Falls. Looking out of The Carriage House windows you see three sorts of Heavy Horse,Clydesdale,Shire and Gypsy Cob.We train them to pull well restored Wagons and carriages which you will want to explore. This is a small farm that both children and horselovers will find brings an exceptional memory to the holiday. This is the Warmest part of New Zealand and many people from the Northern Hemisphere come each year to escape the northern winter.. There is a lot to do in the Bay of Islands so consider an extended visit.We offer 7 nights for the price of 6. You have a fully equipped kitchen and laundry and a lot of space to relax. This is a Quiet location with off street parking and safe for children.There are stairs which may be difficult for disabled people. There are five GOLF courses within easy reach,One called Kauri Cliffs.Fishing is available in Charter Boats by the day or half daySailing is also available by the day or longer.Several 40 ft Yachts take guests out.A BRIGANTINE called TUCKER THOMSON is recommended a day sail and lunch. Ideal for 2 couples or a FAMILY of 4. Adrian is a retired Engineer with some early cars he has restored.He also sails a 35 foot Yacht. There is a jetty at the end of the property Guests may use. 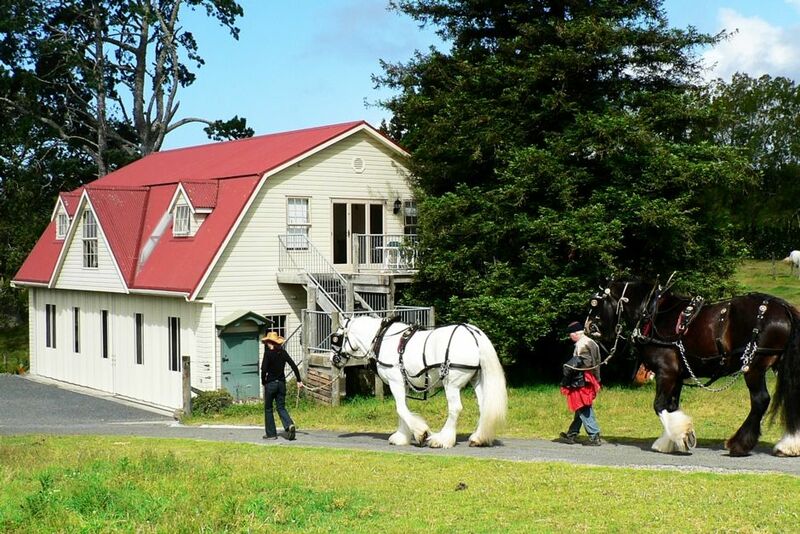 The Carriage house has a large collection of Vintage Horse Carriages and Wagons for guests to see,These are in daily use driving on the public road..Tripadvisor Guest Reviews mention how special it has been to go on such a drive with Adrian. Sylvia & Adrian enjoy meeting Guests who travel to other countries. They have just returned from sailing in the Mediteranian and the Baltic countries.Whilst born in England they have lived in New England and Australia before moving to New Zealand.. We make a point of telling guests about interesting places to visit in the Bay of Islands.We enjoy meeting people and hearing about their life.. They come as Guests and leave as Friends. We have a Rate for 2 and a Rate for 4 Guests. This Boutique Cottage Apartment is Luxury Accommodation in a Quiet Location just 2 miles from town and on the waterfront of KeriKeri Inlet.You look out over Grazing Horses and the water.You can dine outside on the Deck or in the large Living Room. You have a fully equipped Kitchen and Laundry for Self Catering. Kerikeri town has two Supermarkets, Banks Takeaway Retail Shops and many Restaurants. There is a Street Market at the weekend. Both Live Theatre and Cinema. From the CarriageHouse you look over the Kerikeri Inlet which is part of the Bay of Islands in the North West Corner. You have a jetty at the end of our Property for Your KAYAK. Walk Down to fish or view the moored Yachts.A short walk brings you to the STONE STORE and the first NZ settlement buildings. Beautiful, well sized. A good base for exploring. Many Sailing Opportunities including a Brigantine.Boat Trips Round the Islands. Kayak in the River,Vintage Cars are your Hosts Hobby.